To know the price range for each design, please e-mail us or leave comment on this website. We have just added few samples here. We accept group, individual and also online ordering. For negotiation of price, discount only applicable for purchase of 2 pieces and above. With regards to material, we provide variety of choices such as cotton, silk, jacquard or the like. Option for materials mostly depends on customers. So, we offer consultation so that you could see the materials live! Besides, we also provide service for “hantaran” using Batik for occasion such as wedding and engagement. We have our own dealer for this special arrangement and price range is around average. Register with us and get 5% fixed discount for every new design. Just send us you full name, contact number and address to our e-mail at whizurl@hotmail.com. We offer free consultation for company and also individual. To meet us in person, contact us directly or e-mail us to arrange for an appointment. We may consider customers selection for colors, theme, materials, cost and also purpose. In the mean time, we do not hesitate to advice the best option for our customers as Batik Professional. 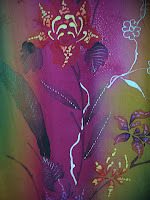 Batik Canting emerged from an idea of combining colors and nature into an art. From thereon we have established our own trait of fashion, back in year 2000. Our product is originated in Kelantan, Malaysia. The parent company, AUFA Batik & Craft Sdn Bhd is located in the city centre of Kota Bharu.